The ZoneFlex T610 combines Ruckus patented technologies and best-in-class design with the next generation of 802.11ac Wave 2 features to deliver industry- leading Wi-Fi performance and reliability. With throughput capacities of 800 Mbps (2.4GHz) and 1733 Mbps (5GHz), the ZoneFlex T610 supports the highest available throughput for Wi-Fi clients. 802.11ac Multi-User MIMO (MU-MIMO) support allows the T610 to simultaneously transmit to multiple client devices, drastically improving airtime efficiency, overall throughput, and availability. The ZoneFlex T610 is backward compatible with all existing Wi-Fi clients, and can function either as a standalone AP or as part of centrally-managed Wireless LAN. The ZoneFlex T610 is specifically designed with industrial grade features such as secure image download. The T610 also has an IP67 compliant USB port that enables field-installable connectivity for IoT applications. ZoneFlex T610 is purpose-built for high-capacity, high performance and interference- laden environments such as outdoor campuses, smart cities, arenas, convention centers and transportation hubs. Enables outdoor IoT applications in a plug-and-play manner and thereby future proofs the access point install. 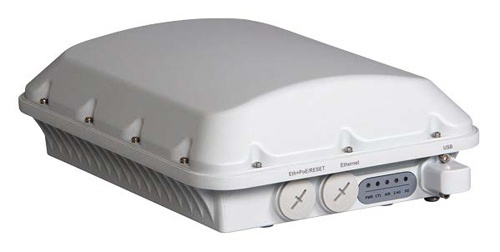 Ruckus Zoneflex T610s Zoneflex T610s,802.11ac Wave 2 Outdoor Wireless Access Point, 4x4: 4 Stream, Mu-mimo, 120 Degree Sector Beamflex+ Coverage, 2.4ghz And 5ghz Concurrent Dual Band, Dual 10/100/1000 Ethernet Ports, Poe In, Ip-67 Outdoor Enclo - Ruckus Zoneflex T610s Zoneflex T610s,802.11ac Wave 2 Outdoor Wireless Access Point, 4x4: 4 Stream, Mu-mimo, 120 Degree Sector Beamflex+ Coverage, 2.4ghz And 5ghz Concurrent Dual Band, Dual 10/100/1000 Ethernet Ports, Poe In, Ip-67 Outdoor Enclosure, -40 To 65c Operating Temperature. Includes Standard 1-year Warranty. Mounting Kit Sold As Separate Accessory. Worldwide Version. Ruckus Zoneflex T610 Zoneflex T610,802.11ac Wave 2 Outdoor Wireless Access Point, 4x4: 4 Stream, Mu-mimo, Omnidirectional Beamflex+ Coverage, 2.4ghz And 5ghz Concurrent Dual Band, Dual 10/100/1000 Ethernet Ports, Poe In, Ip-67 Outdoor Enclosure - Ruckus Zoneflex T610 Zoneflex T610,802.11ac Wave 2 Outdoor Wireless Access Point, 4x4: 4 Stream, Mu-mimo, Omnidirectional Beamflex+ Coverage, 2.4ghz And 5ghz Concurrent Dual Band, Dual 10/100/1000 Ethernet Ports, Poe In, Ip-67 Outdoor Enclosure, -40 To 65c Operating Temperature. Includes Standard 1-year Warranty. Mounting Kit Sold As Separate Accessory. US Version.